Heat oven to 375°F. Pierce potatoes to allow steam to escape. Bake 1 hour to 1 hour 15 minutes or until tender. Let stand until cool enough to handle. Cut potatoes lengthwise into fourths; carefully scoop out pulp, leaving 1/4-inch shells. Save potato pulp for another use. Set oven control to broil. Place potato shells, skin sides down, on rack in broiler pan. Brush with butter. Broil with tops 4 to 5 inches from heat about 5 minutes or until crisp and brown. Sprinkle with cheese. Broil about 30 seconds or until cheese is melted. Serve hot with sour cream and onions. For just 8 grams of fat and 180 calories per serving, decrease the cheese to 1/2 cup and use fat-free sour cream. The next day, microwave the leftover potato insides and top with sour cream and chopped fresh chives or green onions for a quick side dish. To "bake" potatoes in the microwave, pierce potatoes with a fork, and arrange potatoes about 1 inch apart in circle on microwavable paper towel. Microwave uncovered on High 15 to 20 minutes or until tender. 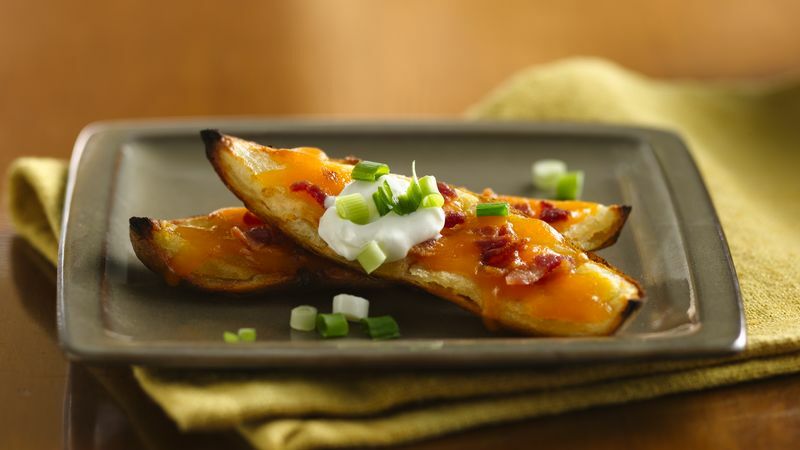 Turn this appetizer into a meal by making Cheesy Ranch Potato Skins. After brushing the potato shells with butter, sprinkle with garlic powder and broil about 5 minutes as directed. Top with finely chopped cooked chicken and the cheese, and broil about 30 seconds until the cheese is melted. Sprinkle with Betty Crocker® Bac~Os® bacon flavor bits, and serve with ranch dressing instead of the sour cream. Omit the green onions.